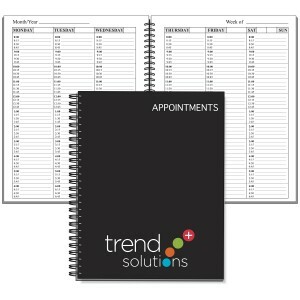 Undated Appointment Book with a Leatherette Cover, with your logo hot stamped on cover. It includes 56 Pages, one Week at a Glance; Monday thru Sunday in 15 minute intervals. Optional Year at a Glance or important Notes on left side. 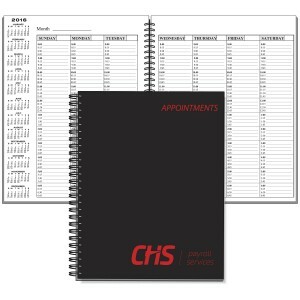 8.5″ x 11″ Dated Appointment Book with a Leatherette Cover, with your logo hot stamped on cover. It includes 14 months-December thru January, one Week at a Glance; Monday thru Sunday in 15 minute intervals.